Want to learn more about designing dashboards that are readable, functional, and insightful? Attend our Dashboard Makeover webinar on May 12, 2016 at 10:00 a.m. PT to see Microsoft Principal Program Manager and Power BI dashboard expert Marc Reguera conduct live makeovers on submissions from the Community! 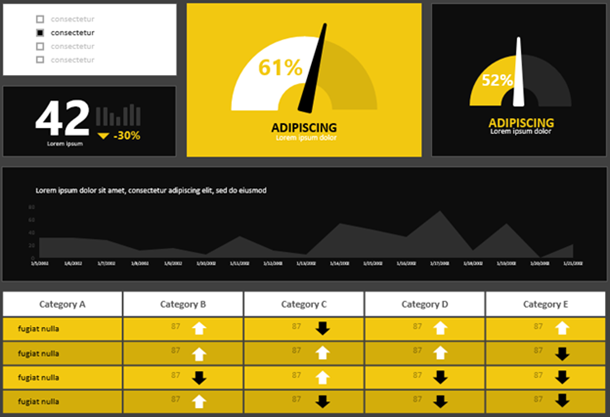 Can a Power BI report be a work of art? It is if it was created by Community member Miguel Myers! Miguel is a Data Scientist as well as a Graphic Designer, and in a webinar last week he shared some of his tips for creating reports and dashboards that are as beautiful as they are informative. You can watch the webinar in its entirety on-demand, or read on for a few highlights! Miguel began his presentation by reiterating a point that will already be familiar to many analysts: the most important part of any report is gathering and preparing the data. This work may happen “behind the screen”, but no amount of whitespace and complementary colors can overcome bad data. That being said, well-prepared data will absolutely be enhanced by thoughtful and eye-catching design work. The first step in any great data design is choosing the correct format, or in Miguel’s words, “What your audience wants is what you have to create.” Imagine who will be looking at your report, and what they expect to get from it. For example, a CEO is likely very busy and not intimately familiar with your team’s work, so a report with explanatory text or an infographic with lots of images are ideal formats. An audience of fellow Power BI analysts, on the other hand, probably wants more detail, so interactive dashboards with slicers are a preferred format. Draw a sketch first. It doesn’t matter what tool you use – Excel, PowerPoint, or even a pen and paper are all options – but sketch out your ideas before you place anything. Enhance the important parts. Even with six or fewer elements on a report page, you still want to guide the viewer's eye to the critical metrics. Highlight important parts of your report with a bright color or summary icon. 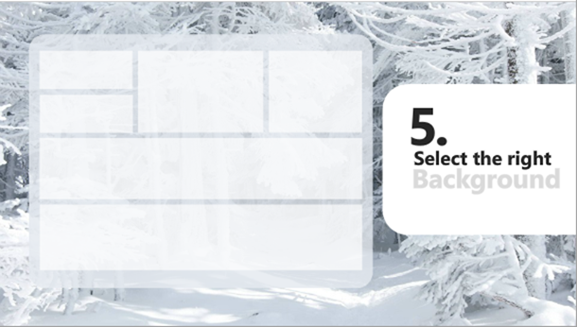 Select the right background. According to Miguel, a white background will make your presentation look “clean” and business-like, a black background will draw the eye to colorful highlights, and the right HD image in the background can add a lot of feeling. No matter who your audience is, or what type of visual you're using, the most important lesson is to think through every decision. “When you design a report,” Miguel says, “you have to create every element with a purpose in mind.” Don’t just drop that gauge in the corner – think about why it goes there and how it will look to your audience. 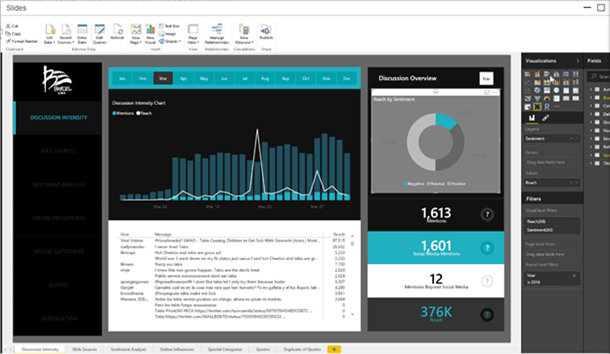 Miguel’s webinar was a great success, and shows just what is possible with the visual elements of Power BI. To see all of the 10 rules for data designs, along with the rest of his presentation and slides, watch the webinar at any time on-demand.